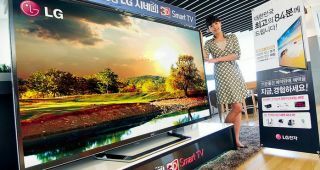 Panel purveyor LG announced its 2015 roster of TVs, an overwhelming majority of which are in the UHD and 4K markets. At the high-end, LG announced its 4K OLED panels that come in 55, 65, and 77-inch varieties and come equipped with smart OS. The first two to hit store shelves will be the EG9600 curved 4K OLED television and the EF9500 flat-screen. The former sports a Quantum Dot LED array, while the latter will sport a new wide color gamut panel that delivers 20-30% more colors than standard LED LCD screens. The middle child of the bunch are the UF series of UHD screens. The line-up will launch in march with the UF8500 and UF9500, both of which are equipped with smart OS. The biggest changes to the series are that the remote will now feature numerical buttons and smart OS will receive a small speed boost when starting up. The other big announcement in terms of telies is the collaboration between LG and audio expert harman kardon. It seems H/K has been drafted to redesign the built-in speakers on all LG TVs going forward, starting in 2015. In a pre-briefing with TechRadar, LG showed us slides that depicted a serious trend toward UHD as the only type of TVs on the market in the year 2018. Tim Alessi, Director of New Product Development for Home Entertainment Products at LG, was hesitant to claim that LG would solely make UHD screens, but said, "like always, LG will be the market leader in emerging technology." Just how soon standard, 1080p HD will go the way of plasma remains to be seen but, if Alessi is correct is his prediction, then the television world will be a more vibrant, lifelike place sooner than we think. We've got more CES 2015 where that comes from!